The final installment of Bill’s memoirs is told by his sister, it seems clear that the loss of his crew, the privations and pressures, fears and anxieties were simply too much. Upon returning home, despite his promise to finish his record, it never was – perhaps like all that went through similar experiences, the thought to revisit it, was simply too much – it was best forgotten perhaps……. ‘When my brother Bill arrived home I was very thrilled when he gave me his Diary inscribed on the cover “Dedicated to my Sister”. He explained that now he was safely home, he would finish writing it up for me, but as time went on he seemed less inclined to even want to talk about it so it remained unfinished. However, on his first evening at home he did tell me what happened when the Russians reached the camp he was then in at a place called Luckenwalde just a few miles outside of Berlin. This was the camp to which they had been force marched by the Germans from the POW camp in Silesia, Poland (about 800 miles) when they were retreating from the Russians. Many of the POW’s died on the way, Bill was one of the lucky ones. “The Joy they felt when the Russians broke into the camp was very short lived and after a few hours freedom, they were very securely back in their huts and the camp had more armed guards around it than when it was in German hands. Bill did say that when the Russians stormed in they (the POW’s) ran out into the town but when they saw the very dreadful behavior of the Russians they felt sick and went back into the camp. The following day they were delighted to see a convoy of American Army trucks surround the camp and they cheered and shouted expecting to be released but their excitement turned to horror when they saw the American Officers in charge being escorted back to their armoured cars and all the convoy moved off again. The POW’s couldn’t believe their eyes and the Russians wouldn’t tell them anything and treated them very badly. This happened again on each of the next three days and on the third day Bill managed to squeeze through trees and bushes and up to the barbed wire where he got the attention of a black American truck driver parked just outside. He told Bill they had come to take the POW’s to freedom but the Russians wouldn’t part with them. The driver after talking to Bill for a while said he didn’t like the look of things and if any of them wanted to take a chance and ‘run for it’ he would back during the night and help them because he didn’t trust the Russians and said he himself wouldn’t like to be in their hands and his officers were very worried about the POW’s. Bill told him he would like to risk it so it was arranged that the driver would come back at an arranged time during the night and bring what was necessary to cut the wire. He told Bill his truck could carry 20 but not one more so it was up to Bill to arrange it with the POW’s. Enough of them gave their names to Bill to make up this number and when it was time to go he went quietly to each one to tell them but only 5 of them came with him. The others had decoded they may be released the next day so they didn’t want to risk it. Many thanks to Katherine , the Niece of Bill Allen and Christina , whose Great Uncle was BIll Reaveley for supplying this additional material on the Bonisch crew. The gathered material is a moving collection of material that spans the extremes between death and survival. Fragments of memories remember a crew who clearly were close and had more than a mutual respect for each other. The presence of 3 “Bills’ in the crew shows a touching method of differentiation – William Reaveley, Frank William Cousins and Bernard ‘Bill’ Allen became known as ‘Uncle Bill’, ‘Brother Bill’ and ‘Cousin Bill’ respectively. The updated Bonisch crew Ops page can be read here. This entry was posted in general and tagged 1942, 1944, 1945, 75(NZ) Squadron RAF, Aviation, B. Allen, Bomber Command, EF233 AA-L, EF513 JN-E, Frank William Cousins, Henry Herbert Marsh, HK553 AA-S, J. Kirk, James Murdoch Thomas McKenzie, James Stuart Millar, John Robert Snodgrass, Lester Lascelles Bonisch, LK378 JN-O, LL866 AA-W, ME702 AA-Q, Mepal, ND750 ? ?-?, ND782 AA-U, ND920 AA-P, Prisoner of War, William Thomas Reaveley, World War 2 on October 1, 2016 by 75nzsquadron. Liberation – of a kind…..
“After two days hanging around at the Goods Yard at the Luckenwalde Station, we are back at the Camp again, as the Germans realised that they would be unable to move us to the new Camp due to the speed of the Americans advance on Leipzig. The Country is almost cut in half so it looks as though we will now remain in IIIA until we are taken by the Allies or Russians, who we have just heard have also launched a large scale attack on Berlin. The two days that we were in the town were quite a pleasant change. The weather was good, and we were given a surprising amount of liberty, such as talking to the German civilians, and walking up and down the railway tracks. We were exchange soap for eggs and bread from the civvies, soap being the only thing we have plenty of, and a thing of which the Germans are very short. A tablet of English soap will purchase the half of the town. The Germans are getting very slack and easy with us now that it is near the end of the War, they know that they have lost and are doing their best to be friendly with the prisoners, but we won’t wear them. All the young men have been put in the front lines and only sixty year old Volk Sturm (Home Guards) guard the camp, some of them are almost too old to carry a rifle. Strong rumours are running round the camp that the Russian Army is within eleven kilometers from the Camp, so if it is true they should be here by the morning. Apparently the rumours were true regarding the Russians, as all the guards have got their kit packed, and are ready to move out this morning, some of them have gone already, and the remainder are more or less on their way. We can hear the Russians fighting in the town already and the last of the Germans are leaving the camp. The k’g’s are breaking down the wire, and roaming all over the camp, great excitement is everywhere. A Norwegian General has taken command of the camp, with an R.A.F. Wing Commander as second in command, guards were organized to prevent the food stores being looted by the Russian prisoners who have gone berserk. The sky is full of Russian and German aircraft engaged in combat, it is very thrilling to watch but very dangerous, occasionally one comes down and strafes the camp, and it is not very funny, especially as the buildings are so flimsy and are no protection from cannon shells. At six o’clock this morning a Russian tank entered the camp, and at last we were liberated, the fellows went mad, cheering their heads off. An Officer jumped out of the tank and the R.A.F. lads mobbed him, he was very embarrassed at the enthusiasm shown him, and I gave him my last cigarette, and was happy to do so. At ten o’clock a whole armoured column moved into the camp, they were also mobbed. Some of the tanks had Germans riding on top, they had been taken in advance. I am very pleased that we are fighting with the Russians, and not against them, they are a very ugly, bestial crowd, half savage and very badly clothed. In the town of Luckenwalde they looted, and wrecked everything, shooting all the German civilians that they met and destroying the shops and houses. I can almost feel sorry for the Germans. The camp is now completely in the hands of the Prisoners with a Norwegian General in camp, great excitement is everywhere. This entry was posted in general and tagged 1942, 1944, 1945, 75(NZ) Squadron RAF, Aviation, B. Allen, Bomber Command, EF233 AA-L, EF513 JN-E, Frank William Cousins, Henry Herbert Marsh, HK553 AA-S, J. Kirk, James Murdoch Thomas McKenzie, James Stuart Millar, John Robert Snodgrass, Lester Lascelles Bonisch, LK378 JN-O, LL866 AA-W, ME702 AA-Q, Mepal, ND750 ? ?-?, ND782 AA-U, ND920 AA-P, Prisoner of War, William Thomas Reaveley, World War 2 on September 29, 2016 by 75nzsquadron. 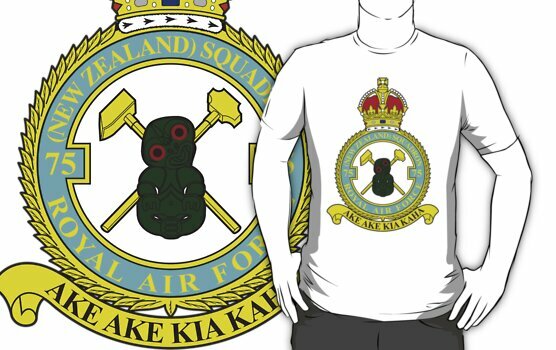 image © Air Force Museum of New Zealand. “A few words about IIIA. We have so little food that we can only lie on our beds all day and think of home and food, we have no energy for anything else. It is a large camp, divided into a number of smaller compounds each of these containing so many men. The Officers are in i=one, Americans, Serbs, Poles, French etc., in the others, yet they meticulously count us twice a day at 7.00a.m. and 5.00p.m. How they think anyone can escape heaven knows, there are about nine walls of barbed wire before you reach the outer fence, and there are hordes of armed guards all along the wire. We learned today that our bread is to be decreased again from today so that we now receive three ounces per day. If the War does not end very soon a lot of us will not survive this imprisonment, we are taking on the appearance of skeletons, I would not like my Mother to see me in this condition. Since last making an entry in this book I have had seven days in bed (if you can call it a bed) with tonsillitis and flu, and due to our undernourishment condition I have had a rough time. The food rations are getting less, due we are told to the R.A.F. bombing of Berlin, which is only 25 miles away, and also to rail junctions in this area. Germany is in a grim state and I don’t know how they stand up to this pounding that they are receiving from the Allied Air Forces. A sensation was created by the British Camp Leader giving us each twelve cigarettes, the first since Christmas. It was a decided booster of moral. The moral of the chaps has received a great fillip at the news of Field Marshall Montgomery’s big drive in the West, and we are all beginning to see visions of an early finish to the War and our return home. The food in Germany has become worse during the last week. Our rations have again been cut very drastically by order of the German High Command. We now receive three thin slices of black bread, and a half lire of soup per day. Luckily a consignment of Red Cross food parcels came in, and we each received one this week, it will supplement the meager German rations for a few days. The area of this camp is about two square miles and is situated twenty five miles from Berlin. The air-raid sirens are howling day and night as the R.A.F. and the Americans bomb Berlin and Leipzig. The Germans in the principal towns of Germany must be bomb happy by now, we stand for hours every day watching dog fights between American and German fighters, its quite thrilling especially when great formations of Allied bombers fly over to bomb Berlin. News keep on coming in every day of the Allies push in the West, and we are all looking forward to being released, as quite a number of P.O.W. camps have been already. It will be great to get home again, especially from the point of view of food. The rations are getting less every day, and the quality worse. Once again we have had the grim news that we are to be moved from the camp to another camp in Bavaria, near Munich, we are to go in the morning at 8 o’clock. The distance is so great and the railway service so bad that we don’t expect to get to 7A Camp inside two or three weeks, if at all, it is possible we may be cut off by the Americans in the Leipzig area. This entry was posted in general and tagged 1942, 1944, 1945, 75(NZ) Squadron RAF, Aviation, B. Allen, Bomber Command, EF233 AA-L, EF513 JN-E, Frank William Cousins, Henry Herbert Marsh, HK553 AA-S, J. Kirk, James Murdoch Thomas McKenzie, James Stuart Millar, John Robert Snodgrass, Lester Lascelles Bonisch, LK378 JN-O, LL866 AA-W, ME702 AA-Q, Mepal, ND750 ? ?-?, ND782 AA-U, ND920 AA-P, Prisoner of War, William Thomas Reaveley, World War 2 on September 27, 2016 by 75nzsquadron. “Our next two days of marching took us to Prousnitz and then on to Goldberg where we were supposed to get on board a train, which prospect cheered the men considerably, but this proved to be just another of the Commandant’s idle and empty promises. We stayed at Prousnitz for two days and then marched out to Goldberg where we were again installed in a barn, this time in a very filthy farm yard, and where our awful predicament really reached a most grim state. The first thing, out bread ration was cut to an eighth of a loaf, and soup almost disappeared. We looked a rough crowd by this time, we had been marching for sixteen days and were unshaven and in the most cases unwashed. We had not had our clothes off either day or night from leaving Bankau, many of the chaps were lousy through sleeping in dirty cowshed and barns. The worst part of the whole trip was the perpetual hunger which we were all suffering from. Men were exchanging gold watches, some valued at £15 and £20 for one small loaf of bread. The seventeenth day on the road and a nightmare march through the night ended the marching. We had again been promised rail transport from Goldberg and had 10 K to march to get to the town and station. We left the farm in the middle of the night and we set off marching in a long weary straggling column, and after an hour we were caught in a fierce blizzard whilst out in the open and on top of a range of hills. It was terrible to see men collapsing in the snow and laying there until the Padre’s coaxed them to go on. We passed on dead man frozen in the snow, it made one think of stories we had heard of the Artic region. We passed lots of German Army transports stuck in snow drifts, some overturned, and Germans cursed us because we would not help them dig the trucks out. We arrived in the Railway Station at eight o’clock the next morning and were herded into the box cars, 56 men to a truck and were packed in worse than in the barns, we could neither sit or lie down, it was grim. We only travelled 200k’s (125 miles) but it took us three days. We stood as long as sixteen hours at a time in sidings with about two or three travelling in between, and worst of all, we had no food whatsoever throughout the journey on the train, the result being that we were all too weak to stand on arrival at our destination. It took us two and a half hours to stagger, I won’t say march, to the P.O.W. Camp, outside the town. The Camp number was IIIA and was an old last war camp, at the moment containing 38,000 men and built for 8,000. There were French, Yugoslavs, Serbs, Italians, Poles, Russians, Americans and English prisoners in separate compounds. It was very much overcrowded, we were put into barracks meant to hold 150 men, 400 in each, it was almost as bad as the train. At this camp we expected to get Red Cross Parcels, but there were none to be had, and hadn’t been for weeks previously. The German rations were also very poor, namely 1/24 of a 1lb. block of margarine, 1/5 of a loaf of bread and 1 cup of thin soup per day, the whole camp was in a state of semi-starvation. On arrival in the Camp, we were taken for a hot shower which we badly needed and when I had stripped off my clothes I was quite scared at the sight of my thin limbs and exposed ribs, I looked almost emaciated, it will take a long while to get our bodies built up and our strength back. This entry was posted in general and tagged 1942, 1944, 1945, 75(NZ) Squadron RAF, Aviation, B. Allen, Bomber Command, EF233 AA-L, EF513 JN-E, Frank William Cousins, Henry Herbert Marsh, HK553 AA-S, J. Kirk, James Murdoch Thomas McKenzie, James Stuart Millar, John Robert Snodgrass, Lester Lascelles Bonisch, LK378 JN-O, LL866 AA-W, ME702 AA-Q, Mepal, ND750 ? ?-?, ND782 AA-U, ND920 AA-P, Prisoner of War, William Thomas Reaveley, World War 2 on September 25, 2016 by 75nzsquadron. “Little did I know what was before me when I last made an entry in this book, we have just experienced three weeks of hell. We left Bankau at 06.30 hours on Friday the 19th of January, it was snowing hard, and a high cold wind was blowing, we were told the temperature was 26° below zero, the roads were covered in ice and snow. Fifteen hundred of us set off to march to Sargan, north-west of Breslau, a large camp believed to contain 65,000 prisoners. The going was very hard, and after a few miles, we were all feeling pretty done up, the wind was the chief trouble and the ground being frozen, it was a terrible strain on our legs a we were floundering all over the place. Our route on that first day took us from Kretzburg on the Polish border, through Konstadt to a village called Wintersfeld, there we were herded like sheep into barns until we could neither sit or lay down. This was a terrible night, made worse by the fact that we were all very fatigued and badly needed a sleep, but it was impossible to obtain any. We had marched all through the day until dusk and had covered 24 kilometers (15 miles). At a quarter past one, we were called out of the barns, fell in and told to march again as the Russians were coming up rapidly behind us, and we were less than a day ahead of them. The Germans marched us all through the night, and the next day. The latter half of the journey being through forests and up steep hills, so we were soon very exhausted, we were throwing away items of kit all the way along to lessen the load on our backs. In a very short time we had only the clothes that we stood in and our two blankets tied round our necks. One chap broke a leg in falling on the ice and was pulled along on a sledge by his crewmates. This was one of the longest march of the whole period. We stopped again in a deserted brick factory at a village by the name of Carlsrue. However, we were not to get much rest this time, as the German Officer in charge informed us that the Russians were coming up so fast they were almost upon us, and the German Artillery were taking over the brick yard as a defense zone. At eight o’clock we started again, to march all through the night, and to make it worse a terrible blizzard blew up again. That night was a nightmare, our object was to cross the River Oder before the morning as the Germans hoped to make a stand there. Men were dropping like flies and the M.O. and two Padres were working like niggers helping them along. We finally got across the river which is very wide at this point, at about eight o’clock in the morning. We were covered in snow and frost, and in a very pitiable condition. Here we were herded into a dirty old cowshed, stinking of dung and cattle, and had to lie on wet smelling straw. However, we were so fatigued that we were soon asleep. The total distance for the day and two nights of marching was 41 kilometers and 12 up to the brickyard, making a total in all of 53 kilometers. We marched out again on the 21st of January to a place called Wanson, another 28 Kils. (17½ miles), here our food was exhausted and we were getting very hungry, we met Poles and Russians on the farms that we stopped at, and we were exchanging soap for potatoes. We met lots of people from German occupied countries, they were chiefly peasants working on the farms. I should have mentioned that all the farms are very large, and are state owned, the farmers live in a group of houses in the centre of the farming area, almost like a small town. There are great barns and cow sheds, and into these the Germans herded us after each days march. The Germans prevented us talking to the Poles and Russians as much as they could. Food from the 22nd January became so short, that we had to march only one day in two as the chaps were getting very weak and ill. Every place we stopped at we left a number of sick behind to be brought along on carts drawn by horses. By the way, due to the enormous shortage of fuel in Germany, the Germans used a tremendous amount of horse drawn transport, and what few trucks they used were only very essential military lorries; these burning charcoal and each towing as many as three smaller cars to save fuel. The roads from Poland were jammed with horses and carts packed with civilian refugees with their belongings. I imagine it was like France in 1940. We saw a number of Russians that had joined the German Army when the Germans were on top, and these refused to fight when the great Russian armies commenced their latest attack. The Germans put them under guard again and put them with us. One very outstanding feature of the march was the shops that were closed in each of the towns, through lack of provisions to sell, especially food shops, these appeared to have been shut for years. The food situation in Germany is very bad, I don’t know how the armies carry on with the poor rations that they receive, and the civilians are in a far worse state. The next few days of marching were very much the same, except that the food situation became more critical. We were cut down to 1/6 of a loaf of bread per day with half a cup of thin barley soup for which we had to queue for as long as two hours. The total mileage covered in the next few marching days was 62 ½ miles or 100 kilometers. The towns or villages that we stayed at were, Heidersdorf, Pfaffendorf, Standorf and Peterswitz. From the last place names, our food ran out completely and we went three days on four bread biscuits. The English Medical Officer told the German Commandant that we could not march any further without food, but it did not make any difference, we still had to march. The German Officer told us that we may go the rest of the journey by train from the next town, this cheered us a little but we were not very hopeful. The German promises were not to be relied upon as we had learned many times before. About this time, at a large road junction, on one of the now famous auto-bahns, we met another great column of English prisoners from a camp called Lansdorf, those poor devils had been bombed by the Russians in mistake for German barracks. There were one hundred killed and six hundred wounded, the others were evacuated. This entry was posted in general and tagged 1942, 1944, 1945, 75(NZ) Squadron RAF, Aviation, B. Allen, Bomber Command, EF233 AA-L, EF513 JN-E, Frank William Cousins, Henry Herbert Marsh, HK553 AA-S, J. Kirk, James Murdoch Thomas McKenzie, James Stuart Millar, John Robert Snodgrass, Lester Lascelles Bonisch, LK378 JN-O, LL866 AA-W, ME702 AA-Q, Mepal, ND750 ? ?-?, ND782 AA-U, ND920 AA-P, Prisoner of War, William Thomas Reaveley, World War 2 on September 23, 2016 by 75nzsquadron. After a lapse of a few months I have decided to add to this story with a brief description of life in the camp. Since I last finished writing I have moved into the new camp and we have got more or less organized in the new barracks. Where we had six in the old huts we now have sixteen in each room. Each barrack is divided into ten rooms with sixteen men in each. There were three hundred men on the camp when I arrived, there are now fifteen hundred. I have made two drawings of the camp to give an idea of what they are like. I am with some decent fellows in my room, nine of them have come from another camp where they have been prisoners for three years. They were flying such planes as Manchesters and Hampdens. One of them was on the same Squadron as Rolly Crawley. For rations on the camp, we do not do so badly, although things are tightening up with each day as the Allies progress further into Germany. We used to get one parcel per week from the Red Cross, but they have been cut to one every two weeks. We expect conditions to get much worse before it finally ends but we don’t mind that because it will mean that the War is finishing and we will be going home, I hope. The weather has been bad since we came into the new camp so there has been very little outdoor sport. However, we are having a few dry days at the present time so we are getting a few games of football again. Recently we have had a stage built in the Entertainment block and have been putting on a few shows. We have a good accordion band, and another classical orchestra is being formed, the instruments have been provided by the Swedish Y.M.C.A. We are also putting on a number of plays such as “French Without Tears”, “Journeys End” etc.. I have a small part in “Journeys End” as a German Soldier. I have been learning German ever since I came on the camp, and can speak the language quite well now. Each week as a new batch of prisoners come in I look for members of my crew, but I fear that my earlier suspicions were well founded, and they were all killed. 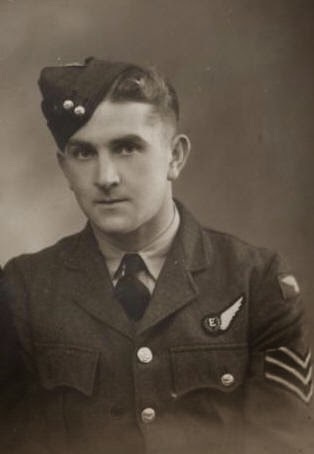 Tough on Bill Cousins the rear-gunner who had been married the week before we were shot down. December, and faced with the prospect of spending Christmas here, not a very exciting prospect but one which we must face with resignation. We will have to make the best of a very bad job. As the situation on the battle front gets worse for Germany, so do the conditions in the camp. First, and most important, the Red Cross parcels stopped coming through so regularly due principally to our aircraft bombing and strafing the railways. The result is that parcel issues have been cut to one every two weeks instead of every week. The Germans are being gradually cut also, but not yet drastically, however, it does mean that Christmas will be grim. The weather has definitely broken up now, and at the moment of writing it is snowing heavily and strong cold winds are blowing from the east across Poland from Russia. The hut I am billeted in is open to these winds and window is just a solid pane of ice, both inside and out. If the reader would care to turn to the drawing I have done of the camp, they will see my window facing due east. Strangely enough, I haven’t found it very cold yet, though the fellows who have been prisoners for three years or more are huddled round the stove like old women, it is pitiful to see their lack of resistance. Either I am hot blooded or their existence has been weakened by undernourishment. Christmas has been and gone, and it was as grim as I expected it to be. The situation reached its worst when we ran out of parcels, and had to exist on German rations as we had fifteen cigarettes to last us for two weeks. My greatest disappointment was in not receiving a letter in time for Christmas, in fact, up to now I have not yet received any mail. An unhappy incident occurred, the day after Boxing Day during an air raid. Whilst a raid is in progress anywhere in the vicinity of the camp, everyone is compelled to stay in the barracks, but one Canadian absentmindedly wandered outside the door and a guard shot him. He died twenty minutes later. Have just learned today that a new Russian offensive has opened in the sector opposite our camps. It is rumoured that the camp will be evacuated, but nothing definite has been heard. The Russians are coming up fast and we have been instructed to pack, and be ready to leave at a moments notice. This entry was posted in general and tagged 1942, 1944, 1945, 75(NZ) Squadron RAF, Aviation, B. Allen, Bomber Command, EF233 AA-L, EF513 JN-E, Frank William Cousins, Henry Herbert Marsh, HK553 AA-S, J. Kirk, James Murdoch Thomas McKenzie, James Stuart Millar, John Robert Snodgrass, Lester Lascelles Bonisch, LK378 JN-O, LL866 AA-W, ME702 AA-Q, Mepal, ND750 ? ?-?, ND782 AA-U, ND920 AA-P, Prisoner of War, William Thomas Reaveley, World War 2 on September 21, 2016 by 75nzsquadron. “The remainder of that night we travelled only a very short distance, and the next day was even slower as the Germans were scared stiff of our aircraft spotting us and straffing the train, this having been a popular sport with our Spitfires, Typhoons and American Lightnings for months past. However, the journey was very grim from start to finish. We were too cramped to sleep, and we were not getting any food other than the issue of half a loaf that we received in Paris. The journey was more or less uneventful, we saw many signs of bomb damage especially to the railway where our airforces had done a really good job of work. We arrived in Frankfurt after four very miserable days on the train. The railway coach was Italian, and built I should think about the same time as the Ark. We were taken a little way past Frankfurt to a place called Oberussel, here we boarded a tram-car, the last thing that I ever expected to ride upon in Germany. We travelled roughly two miles on the tram-car, and finally arrived at the now famous Dulag Luft. This place I had heard so much of in England as it is quite notorious for its’ treatment of R.A.F. Flyers. The principle object in being taken there is to be interrogated by German Intelligence Officers. Immediately on arrival in the Camp we were again searched and then placed in single cells almost like Dartmoor I should imagine. The following morning we were taken out one at a time, and were interviewed by a German Officer. I was very lucky as my interrogation lasted only a few minutes during which time they succeeded in getting my number, rank and name. I was then taken back to my cell No.26, where I spent one more night and then was taken out, and placed in another compound where there were large huts and lots of other fellows so I felt a little more cheerful. Some of the chaps were kept in solitary for as long as six weeks, being taken out at intervals for further interrogation and grilling. If I had stayed in the cell much longer I would have gone crackers in a few days. The following day, we were on our way again, this time to a transit camp at a place called Wietzlar, about forty miles from Dulag Luft. On arrival at Wietzlar we were to be sent to Camps all over Germany. There were a lot of Americans at the transit camp, including a Colonel ex-mustang pilot. He was in charge of us at the camp. The conditions here were very good after Dulag Luft and France, the food being exceptionally good. We had to stay here until there were sufficient R.A.F. personnel to make up a party to travel to a permanent camp. Here were a lot of Americans in the camp but they go to separate camps from the R.A.F. However, as the food was both good and plentiful I did not mind staying there for a week or two, the food of course, was Red Cross, also cigarettes, which we got in quite good supply. At the end of the week however, forty of us were taken to the station again, this time we marched as we were all feeling much better than when we had arrived at the transit camp. We boarded a train this time with barred windows, and just as uncomfortable as the one on which we had travelled from France. For rations, we had one Red Cross parcel between two men, also one German loaf between two. This journey was a little more interesting than the first, as we passed through many German towns including Dresden, Liepzig and Breslau, all were pretty well knocked about as one can guess considering the bombing they have had from the R.A.F. and the U.S.A.A.F. Frankfurt also was very badly wrecked. The German countryside is very beautiful and we noticed that there was hardly a yard of ground which was not growing something, especially vegetables and fruit trees. The houses all seem to be built very large and picturesque, and very clean. I can’t understand why these Germans don’t get wise to themselves and look after their own Country instead of interfering with everybody else. On the morning of the fifth day of travel through Germany, we arrived at our destination, a new camp at Bankau in upper Silesia, only eight miles from the Polish border, and a little more to the Czechoslovakian border. The camp had only been open two weeks and there were only about three hundred chaps in it. Hey were all in small huts each built to hold six people. These huts were just temporary structures that had been erected until the permanent structures were completed. We were informed that we were to move into the new camp in October. One thing I was very pleased to see when I arrived was that there were many facilities for sport, especially football. A Scots chap and myself want to work on a football ground, and with some timber that we got from the Germans we made some goalposts. The camp was split into eight divisions, so each of the divisions selected two teams and we started a league. 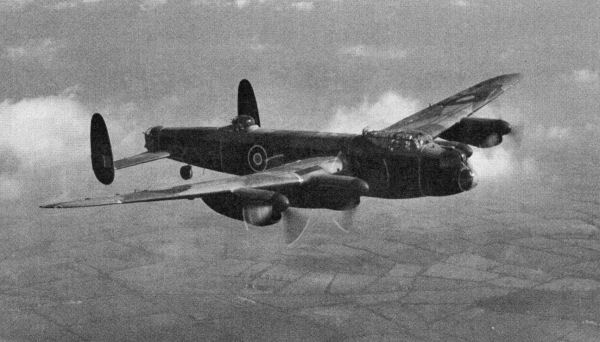 This entry was posted in general and tagged 1942, 1944, 1945, 75(NZ) Squadron RAF, Aviation, B. Allen, Bomber Command, EF233 AA-L, EF513 JN-E, Frank William Cousins, Henry Herbert Marsh, HK553 AA-S, J. Kirk, James Murdoch Thomas McKenzie, James Stuart Millar, John Robert Snodgrass, Lester Lascelles Bonisch, LK378 JN-O, LL866 AA-W, ME702 AA-Q, Mepal, ND750 ? ?-?, ND782 AA-U, ND920 AA-P, Prisoner of War, William Thomas Reaveley, World War 2 on September 19, 2016 by 75nzsquadron.